Rep. Ilhan Omar has intensified her claims that some Jewish lawmakers have a dual loyalty to Israel, rejecting criticism from Democratic colleagues that she is engaging in anti-Semitism. This isn’t the first time. Her tweet about AIPAC contributions and related donations are “all about the Benjamins,” a not so subtle swipe about Jewish money and political control. In 2012, she said that Israel was hypnotizing the world as well. That post led to a sit-down with local Minnesota Jewish leaders last year, but given her serial refusal to recognize that her views are bigoted, they’re reportedly not going to treat her with “kid gloves” anymore. The fallout from the dual loyalty remarks has embroiled the House Democratic leadership in another nasty bout of infighting. The pressure to put forward a resolution was met with some intense criticism from fellow Democrats, which erupted into an all-out brawl behind closed doors yesterday. Some Democrats are rightfully saying that they should vote on the resolution condemning anti-Semitism. Others found it redundant and wondered why Omar was being held to a different standard. This is the Democratic Party; everything is on a graduated scale. And obviously, anti-Semitism isn’t a serious problem compared to Trump being in the White House. The Left has long been infested with those who hate Israel and Jewish people, so this isn’t shocking. REPORTER: Do you think that Ilhan Omar understands why her comments were problematic? And what happens if this happens again? SPEAKER NANCY PELOSI: First of all, thank you for the question. I don't think the congresswoman is -- perhaps appreciated the full weight of how it's heard by other people. I don't believe it was intended in an anti-Semitic way. But the fact is that's how it was interpreted. We have to remove all doubt, as we have done over and over again. We're working now on a resolution on the floor that will, again, speak out against anti-Semitism, anti-Islamophobia, anti-white supremacy and all the forms it takes, that our country has no place for this. REPORTER: She hasn't apologized? Does she need to apologize? PELOSI: She may need to explain that she did not -- It's up to her to explain. But I do not believe she understood the full weight of the words.When you're a congressman --when you are an advocate out there, as I was. I appreciate all the enthusiasm that comes into Congress. I told you that before. That was me pushing a stroller and carrying those signs. I understand how advocates come in with their enthusiasms. But when you cross that threshold in the Congress, your words weigh much more than when you're shouting at somebody outside. And I feel confident that her words were not based on any anti-Semitic attitude. But that she didn't have a full appreciation of how they landed on other people where these words have a history and a cultural impact that might have been unknown to her. Okay—I hate to play this game, but these aren’t our rules. It’s the Left’s protocols. 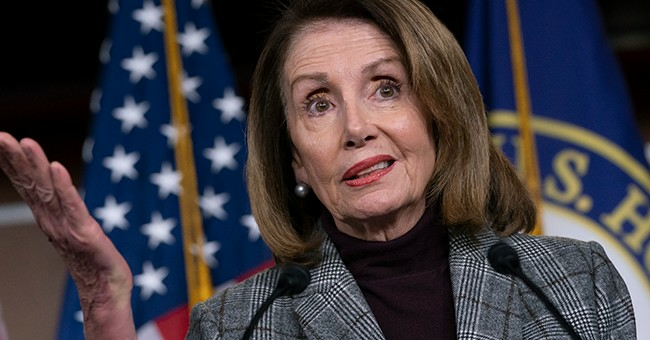 Is what Pelosi said…racist? The black congresswoman didn’t know what she was talking about? Hey, this is the outrage bubble we live in now. I don’t think so. Of course, I don’t, but if your defense is ‘she didn’t know what she was really saying,’ the Hill equivalent of ‘my dog ate my homework’ excuse, then Nancy really has lost control. It’s either that or she just incompetent. It might be a tad of both, to be honest. It took less than 3 months for Pelosi to lose control of her party. Just wild.